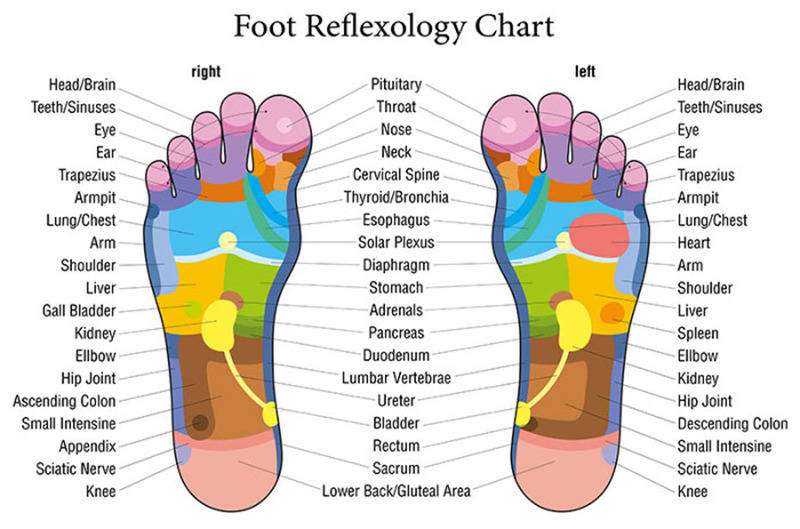 Reflexology is an ancient Chinese practice where pressure is applied to specific points on the hands, feet, and ears. These reflex points correspond to different organs, systems, and parts of the body. By applying pressure to these points, you can relieve pain and promote health in various parts of your body that may be suffering. 1. If your throat hurts. Rub the middle of your big toe for instant relief to your sore throat. Your big toe is closely tied to the throat and your pituitary gland. 2. If your beck hurts. Rub the point where your big toe meets the rest of your feet. This area helps relieve pain in the neck as well as nose and spine. 3. If you have pain in the lower back. Rub the heel of your foot. Give it a thorough massage. You may want to consider soaking your feet in nice, warm, relaxing water first. The heel helps relieve pain in your back, sciatic nerve, knees, and calves. 4. If your gall bladder hurts. The middle of the arch of the foot is where you should massage. This area also pertains to the pancreas, liver, spleen, kidneys, and adrenals. 5. If you have toothache. Rub the tip if the middle toe on your left foot. This area is directly related to the teeth. The middle toe on the right side helps relieve other aches in your head/brain.